Hailing from a Brahmin family, Acharya Pramod Shashtri has been learning and practicing astrology since the tender age of 17. With over 10 years of experience in the field, his keen interest in the science eventually led him to take up a professional course on the subject to improve and enhance his knowledge as well as get in-depth insights into the various branches of astrology. As a student of Sanskrit, he was deeply inclined towards spiritualism, astrology, varied religions and the occult sciences. During his astrology studies, he learnt spiritual and holistic healing, naturopathy, yoga, reiki etc. He is also well-versed in predictive accuracy in almost every topic like Health, Finance, Relationship, Property, Education, Love, Marriage, Compatibility, Progeny, Career and Birth time certification. 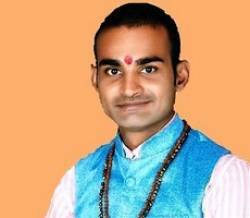 He has completed the following degrees: Degree- 1- purv Madhyama 2-Uttar Madhyama 3-shashtri (Jyotish, Sanskrit, Economics) from-Sampoornand Sanskrit University Varanasinn52 TV show (Sanskar, Ishwar, Sarv Dharm Sangam) With the use of Parashara and Jaimini System of astrology, he is able to predict events in life. Not only this he also has an expertise on Annual (Varsha-Kundali) and Horary (Prasna), a technique used when an individual’s birth chart is not available and the answer to a specific question is required.Astrology is the study of the movements and relative positions of celestial objects as a means for divining information about human affairs and terrestrial events. Astrology has been dated to at least the 2nd millennium BCE, and has its roots in calendrical systems used to predict seasonal shifts and to interpret celestial cycles as signs of divine communications. Many cultures have attached importance to astronomical events, and some – such as the Indians, Chinese, and Maya – developed elaborate systems for predicting terrestrial events from celestial observations. Western astrology, one of the oldest astrological systems still in use, can trace its roots to 19th–17th century BCE Mesopotamia, from which it spread to Ancient Greece, Rome, the Arab world and eventually Central and Western Europe. Contemporary Western astrology is often associated with systems of horoscopes that purport to explain aspects of a person's personality and predict significant events in their lives based on the positions of celestial objects; the majority of professional astrologers rely on such systems.